Going to the movies last weekend I quite accidentally chose two films that had many parallels in terms of story and theme so I thought it'd be interesting to examine them together. Both focus on terrorism and quite refreshingly revolve around strong female characters who find themselves confronting difficult ethical decisions when they are thrust into that world. First off was James Marsh's Shadow Dancer. The setting is the UK in 1993. The British government and the IRA are warily approaching a cease-fire agreement, a development that does not please all of the IRA's members, many of whom view it as capitulation and have continued organizing attacks without the approval of the group's leadership. One of these cell's members is Collette McVeigh (Andrea Riseborough), for whom the cause has become intertwined with family history following the shooting of her brother when she was a child. After she botches the bombing of a London tube train, she is picked up by British Intelligence, who are eager to negate any threat to the peace process. 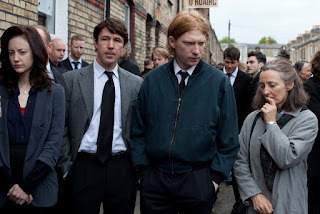 She is offered a deal by MI-5 agent Mac (Clive Owen): inform on the activities of her IRA co-horts, particularly her brothers Connor (Domnhall Gleeson) and Gerry (Aidan Gillen), and she will receive immunity and the chance to start anew with her son. But while Collette wrestles with her impossible position and struggles to conceal it from her family, Mac battles agency bureaucracy and strategies that threaten his newly turned asset with exposure and assassination. Central to the film is the performance of Andrea Riseborough, who was one of the bright spots of Oblivion earlier this season as Tom Cruise's upbeat partner. Here she goes the opposite route, portraying an introverted and withdrawn woman, a coiled spring of inner conflict desperately concealed behind a sullen mask of control. We sense it's a demeanor born not only from her family's loss but as a necessity given her activities. Collette is a woman who's learned to hide herself, to give nothing away through expression or body language. Acting wise, it's a tightrope for Riseborough, challenging her to clue the audience in on what Collette is thinking and feeling even as the character tries to ensure no one around her can. Though Riseborough succeeds, the closed-off nature of the character can be frustrating and becomes emblematic of the film's problems at the scripting and directing level. While both the character and the dramatic set-up she is caught in are compelling, we always feel at somewhat of a remove from the emotions involved. I kept hoping for at least one scene where we get more of a sense of Collette's viewpoint and really see the toll this life has taken on her and her relationships with her son, her mother (Brid Brennan), and her siblings, none of which feel fleshed out. Even her divided loyalties get subsumed into the story mechanics as she attempts to dodge the suspicions of Kevin (David Wilmot), the local IRA counter-intelligence man. While we see her taking precautions to avoid detection and trying to rebuff his prying questions, she is reduced to being the woman-in-peril for much of the second act. Part of the issue may also be that Collette is such a reactive character by design. We sense she joined up less from patriotic zeal or a desire for revenge than from internalized guilt over what she perceives as her role in her brother's death (she had sent her brother in her place to buy her father's cigarettes) and a sense of familial duty. Despite her involvement in IRA operations, there are hints of a great reluctance on her part to actually be responsible for taking any lives herself. She seems to have been pushed along her path by circumstance and obligation, a situation continued by Mac's pressuring her to turn. But where this would suggest an arc for her character, the question of what Collette would wish for herself is never really asked. Instead the narrative burden switches to Mac as he tries to manage her case from the outside but quickly finds himself shut out of department briefings and marginalized in the agency's operations. Owen hints at a savior complex brewing in Mac as his sense of responsibility for the woman he's turned begins to build into something else, but he's not really a compelling hero. There is a flash of romantic feelings between the two but it's never built on and feels unearned, making for an awkward and problematic moment, perhaps a remnant of some discarded plotline. The lack of emotional connection to the aspects of the family and political aspects of the story isn't helped by the sometimes confusing presentation of it. There are a flurry of names and affiliations thrown about during briefings or reports that are sometimes hard to connect to the characters they apply to. Gerry and Connor's exact position in the IRA hierarchy is never made very clear nor is the vague animosity we sense between Connor and Kevin. The characters never feel like more than pieces on a narrative chessboard. As a result, when we do get a sense of the larger game Collette has been made a pawn in, the reveal is interesting on an intellectual level but lacks resonance. Since the film is based on a novel, we also sense shreds of subplots and relationships that have been pared back. Gleeson and Gillen are both talented actors but seem stranded in their roles, never given much to work with. Brennan is a bit luckier and exudes a somber resignation regarding the path her children have followed. There's also a welcome appearance by Gillian Anderson as Kate, Owen's secretive superior. In a nice bit of narrative harmony, we get a scene of her calmly discussing elements of the case with Mac at her home with her kids about, letting us see that she has a much easier time than Collette when it comes to juggling the life-and-death responsibilities of her position with her family responsibilities. On the positive side, director James Marsh does an excellent job at building suspense. The silence of the opening scenes as young Collette takes care of housework after inadvertently sending her brother to his doom keeps us on edge for the inevitable tragedy. Long takes of Riseborough on the subway make us instantly wary and convey her unease growing into panic. Perhaps the best example is Collette's interrogation by Kevin, as she struggles to stick to her cover story and maintain her calm while one of his thugs ominously sets up a plastic tarp on the floor of an adjoining room, preparing for the outcome. Marsh also beautifully sets up tiny details, such as the bruises on Collette's arms from her manhandling by police or the constant presence of military vehicles prowling the backgrounds of the Irish scenes, which help create a tangible sense of place and time. It also must be said that some of the film's shortcomings, particularly when it comes to Collette's character, are mitigated by the brave and uncompromising ending, in which she finally takes some action that helps define the choices she has made. It makes me wish everything that come before it has been as engaging on an emotional level as the story has set it up to be. 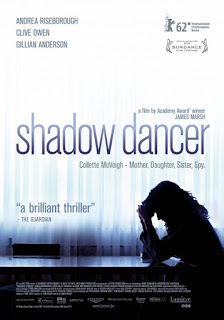 Shadow Dancer distinguishes itself as a classy, admirable thriller but never quite succeeds as an enjoyable or compelling one. So following that, we come to The East, where we find a resistance movement struggling not against nationalistic oppression and but an even more imposing force of the modern era; the hegemony of corporate America. Just as the nature of the struggle differs from that of our previous film, so does the presentation of it, to its benefit. In fact, The East emerges as an early candidate for one of my favorite movies of the year. 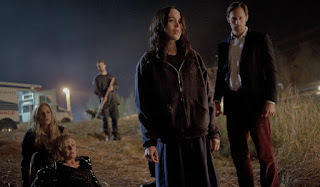 A lot of the credit for that falls squarely on the shoulders of lead actress and co-writer Brit Marling, who again proves herself a talent to watch. The film marks her second collaboration with co-writer and director Zal Batmanglij and it's interesting to compare it not only to Shadow Dancer but to the pair's previous film together, the fascinating but frustrating Sound of My Voice. That film had Marling playing the seductively soothing guru of a secretive religious cult that is infiltrated by two journalists hoping to expose her as a fraud. Here, Marling is the intruder, an operative for a private intelligence firm that has been contracted to bring down the East, an ecoterrorist group conducting attacks against executives of various companies in retaliation for their crimes against the public and the environment. Whereas Collette was forced into being a double agent by circumstance, Marling's character, Sarah, is aggressively ambitious and has fought hard for this assignment, eager to prove her abilities to her corporate handler (Patricia Clarkson). But as Sarah gradually works her way into the group's confidence, zealously taking up their cause as part of her cover, the righteous anger that fuels their criminal acts begins to affect her and causes an inevitable crisis of conscience. One of the strongest elements of Marling's performance and what makes her such a joy to watch is her convincing depiction of Sarah's fearsome intelligence while carrying out her assignments, both for her company and as a double agent in the group. How many times have we been introduced to a protagonist, told she or he is incredibly smart and are then expected to accept it at face value? Marling and Batmanglij instead give us ample opportunity to see Sarah's cleverness in action, revealing her capacity for anticipating problems and developing contingencies as well as her ability to improvise and make use of her environment in a crisis. Whether she's injuring herself to force a potential contact into taking her along with him or trying to mitigate a threat to her cover through psychological tactics, we completely accept that she is every bit the professional the film sells her as and she proves a much more proactive heroine than Collette, which makes it all the more compelling as she begins to question her mission. 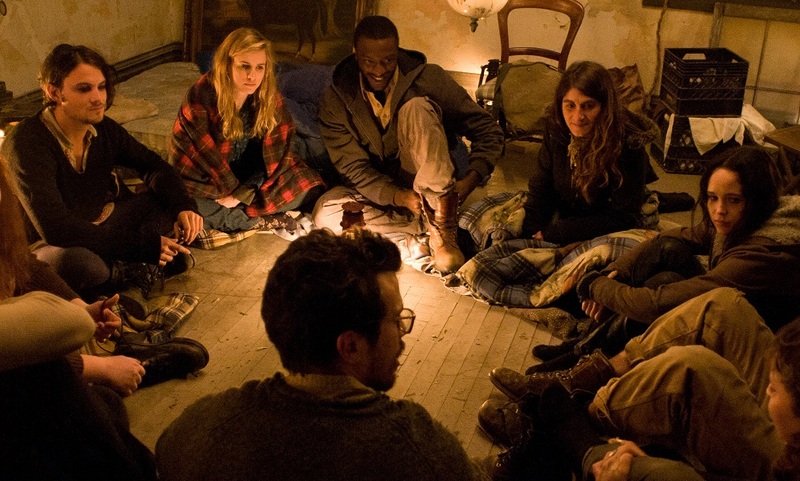 One of the film's interesting areas of exploration involves the personal baggage that would drive someone to join such a group. 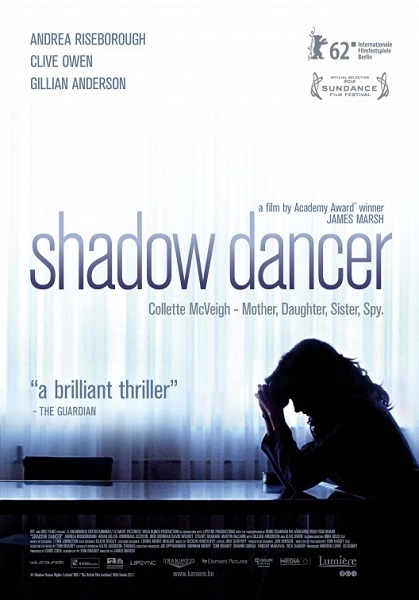 Building on the personal guilt on display in Shadow Dancer, here we are introduced to individuals in the collective who are wrestling with self-loathing, rebelliousness, revenge and even a need for acceptance. Part of Sarah's own conflict stems from her growing awareness of the hollow and callous mindset of her corporate masters as compared to the seemingly empathetic environment the group functions in. Despite her cool demeanor, there is a deep compassion to Sarah that chafes against the rigid ruthlessness underlying her company's ethos. 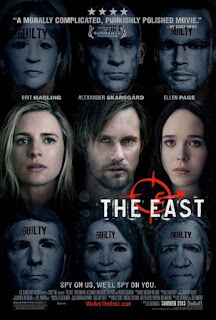 To the film's credit, while corporate America doesn't get the most flattering portrayal, the East isn't held up as a pinnacle of morality either. Many of the offending executives seem to be more in willful denial about their harmful effects on society than outright evil while we see hints that the East's members are willing to be frighteningly ruthless in achieving their ends. As a result, the focus is less on presenting anti-capitalist or anti-corporate propaganda than on asking questions pertaining to both corporate and personal responsibility and depicting one woman's quest to find a righteous path between them. Some of those questions center on whether the group's operations, which they refer to as 'jams' and which are specifically tailored for each environmental transgressor, are any less cruel when they're committed in the name of the public good. Is an attack that can leave someone injured, disabled, and possibly terminally-ill any more virtuous if it's waged for ideological motives rather than financial ones? We see this conflict play out in Sarah as she sees the televised effects of one of their jams. The tone of her voice wavers between excitement that the operation has succeeded in gaining public attention and revulsion at the grievous injury she has helped cause. Complicating the matter is her growing interest in Benji (Alexander Skarsgård), the group's mysterious leader. Initially, her attempts to discover more about him are intended to gain intelligence for her report, but slowly her curiosity develops into an undeniable attraction, one that Benji seems reluctant to acknowledge. Anyone who's watched an episode of True Blood featuring him can testify to Skarsgård's considerable charisma. Here's it's shrewdly channeled into conflicting directions that leave us unsure of what to make of him from scene-to-scene, as he alternately exudes the inspiring magnetism of a noble activist and the disquieting allure of a cult leader. As Izzy, Benji's second-in-command, it seems at first Ellen Page has been saddled with the disappointingly familiar role of being Sarah's chief adversary in the group, the suspicious one that will block her efforts to earn their trust with skepticism. Thankfully as the story proceeds, the character blossoms into something more affecting as Izzy's discomfort and alarming fervor are revealed to stem from some deeply traumatic personal history with their enemies, requiring a balance of stony resolve and heartbreaking pain that Page manages expertly. Meanwhile Clarkson is flat-out unnerving as Sharon, Sarah's chilly superior, particularly since she's been so good at inhabiting such warm, compassionate characters in the past. She's the type of person who does not offer praise or respect easily, allowing us to understand how a character like Sarah that thrives on overcoming challenges would be so eager to earn her approval. But at heart (or lack thereof in this case), Sharon represents the horrors of the corporate mindset personified, a frozen soul unable to comprehend anything beyond what benefits her firm and its objectives. Given a warning regarding another impending attack by the East, she casually dismisses its importance since the intended targets 'aren't clients.' It's no wonder she needs someone like Sarah to report on the East; it's doubtful she'd ever be able to wrap her head around their principles. In contrast to the chilly, perfunctory visual style of Shadow Dancer, cinematographer Roman Vasyanov lenses an absolutely gorgeous film bathed in warm, vibrant hues, particularly as Sarah moves deeper into the group, implying her growing awareness of the natural environment the group is attempting to protect. The grimy abandoned house they operate from becomes oddly inviting, particularly when contrasted with the antiseptic offices and blank domesticity of Sarah's normal life. More important in comparison to our earlier film, Batmanglij's direction does a great job of giving each scene the emotional thrust and direction it demands. Even when Sarah's resolve is uncertain, we understand what we need to regarding where she is on her journey. The various members of the group, even those we don't get to know well, get chances to display their individuality and offer distinct points-of-view that allow us to understand the group's dynamics. These relationships are illustrated in another scene that calls back to Sound of My Voice, with the members sitting in a circle, engaging in exercises to strengthen their personal connections; happily it doesn't involve vomit this time. The East confirms Marling as a major talent and makes me equally excited to see what Batmanglij can accomplish as well, though I do hope the two continue working together, if only to continue to provide Marling with a showcase for the kind of strong, entrancing performances she's proved herself capable of. Happily all other elements of The East reach the high mark of quality she sets, resulting in a full-blooded thriller that encourages you to both think and feel your way through its thorny questions and which offers a thoughtful bit of counter-programming to the bash and crash of the summer blockbusters.